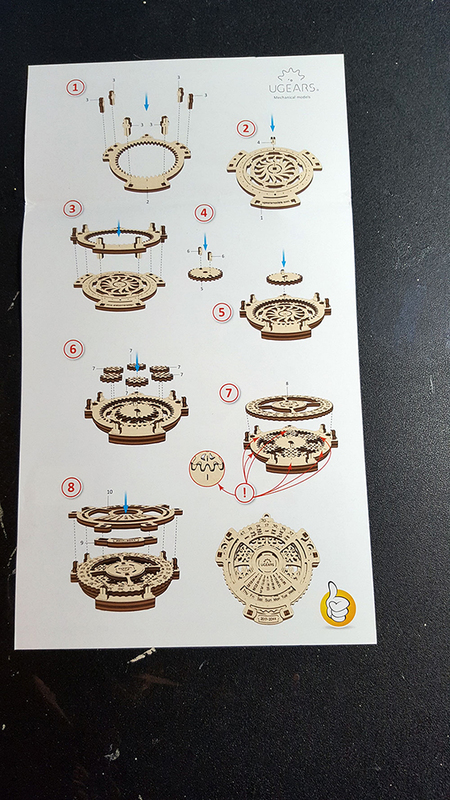 A few days ago, I went searching for a little build project that would be fun, but not too difficult (it's been a rough month - I'm not in the mood for difficult). 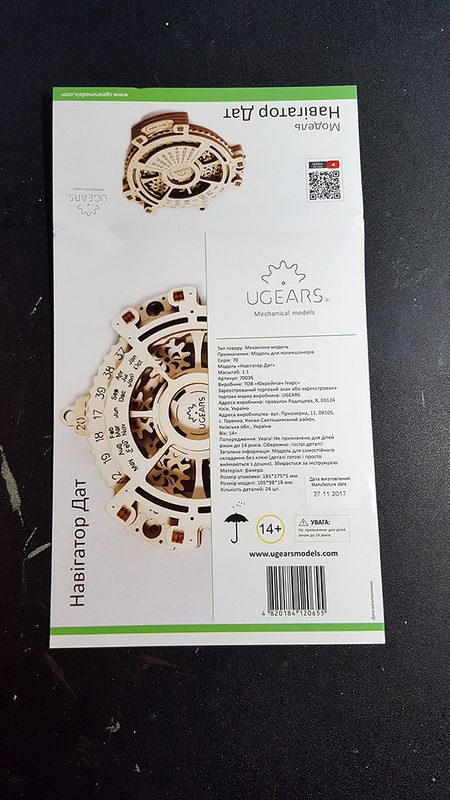 I came across several model kits by UGears and decided they looked interesting. I ordered one of the most basic, inexpensive ones I could get to start off with. 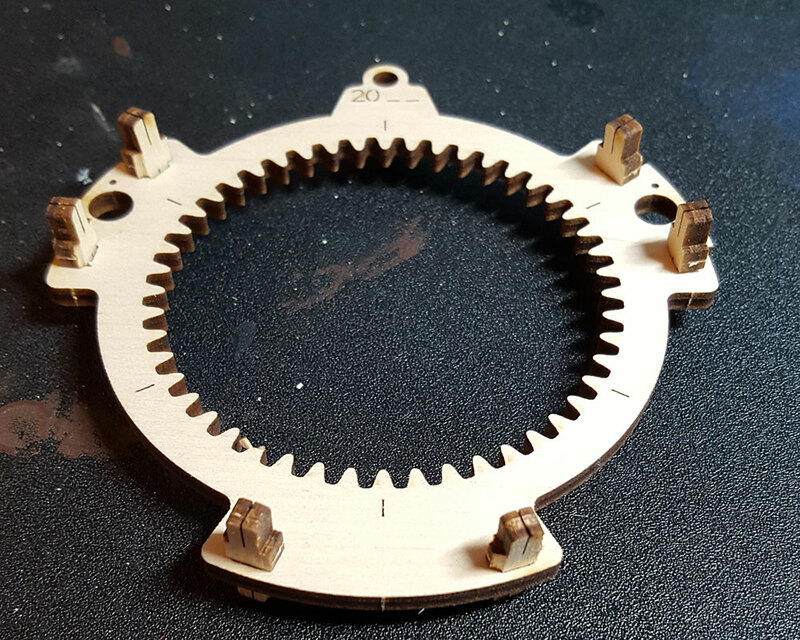 I wanted to make sure it was something I could see to do and I wanted to see what the quality was like before I invested money into a more complicated kit. 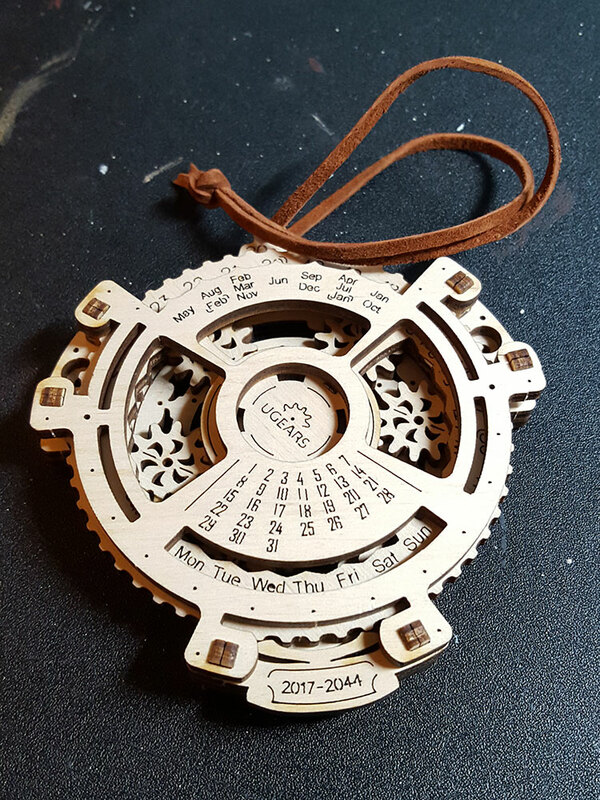 I purchased the Date Navigator because it seemed like a good place to start and the end result would give me a cool desk trinket that could actually serve a purpose. 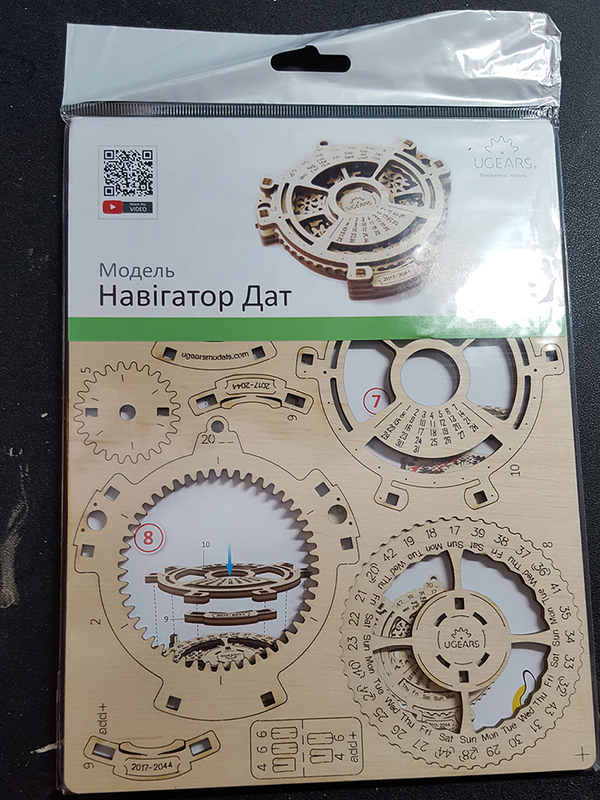 Simple enough - one sheet of "parts" in plastic wrap, sent to me in a padded envelope. 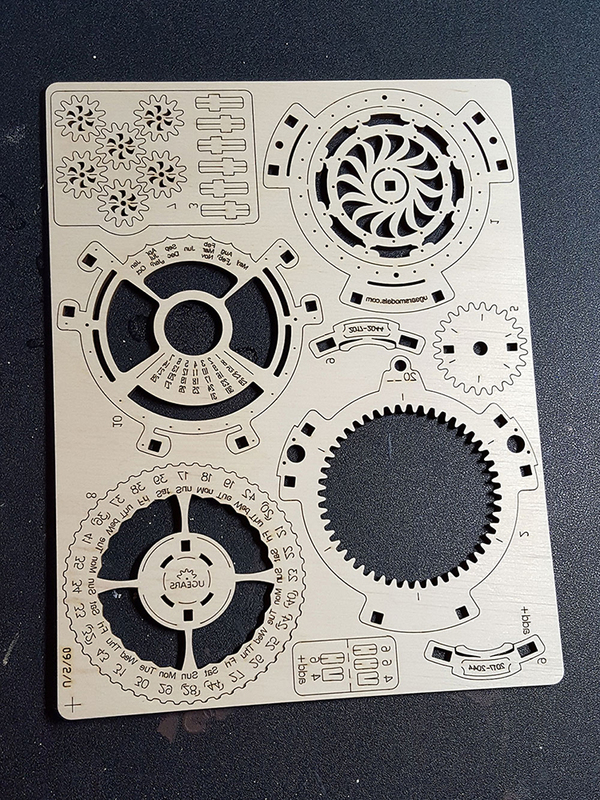 The parts, it turned out, were 1/8in plywood and I could see all the numbers and markings just fine. Yay! So far, so good on the eyeball side. But wait a minute! This isn't in English at all. I could scan that QR code and see if it had English instructions, but I'm lazy, so I just flipped the page over, instead. Ah, here we go. No words, but plenty of numbers. Thankfully, math is the universal language (uh, also, there are pictures). I did what it said to do in the first picture. And then I did step 2 - which was more putting of pegs into holes (this proved to be a common theme). On that note, the pegs were a little hard to remove from the plywood simply due to their small size. If you're going to make this, I recommend using your Sword of Exact Zero! to carefully remove them. 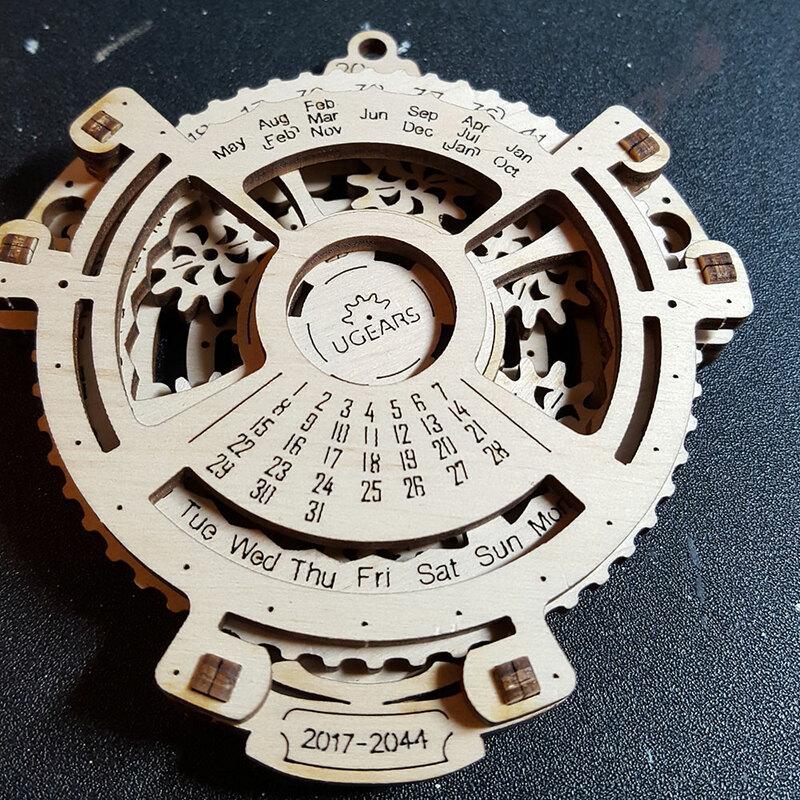 After that, it was time to put the Year Wheel on (I'm calling it a Year Wheel). 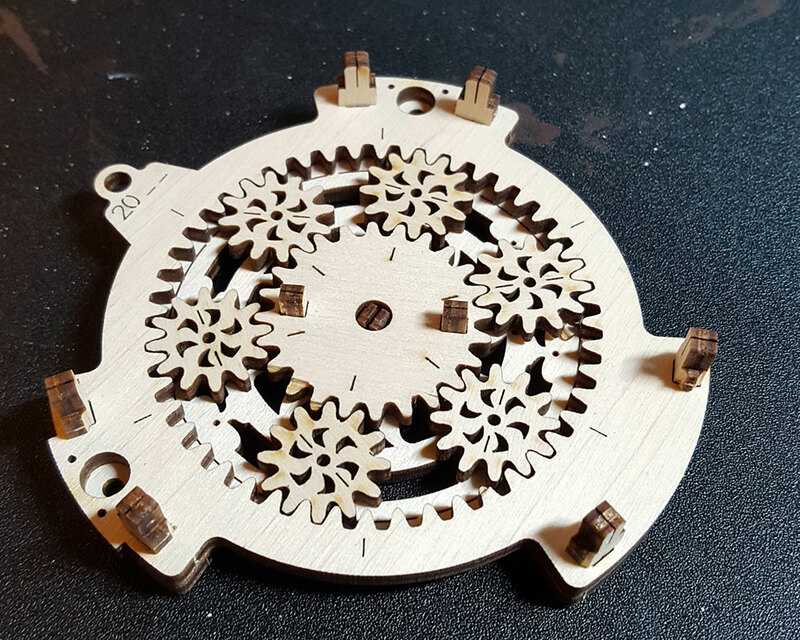 This held the central gears in place and gave the promise of being at least passively useful stuff later on. Then I put the final two pieces on and that was that..... Mostly. It had a hole in the top for a cord, so I added a cord. 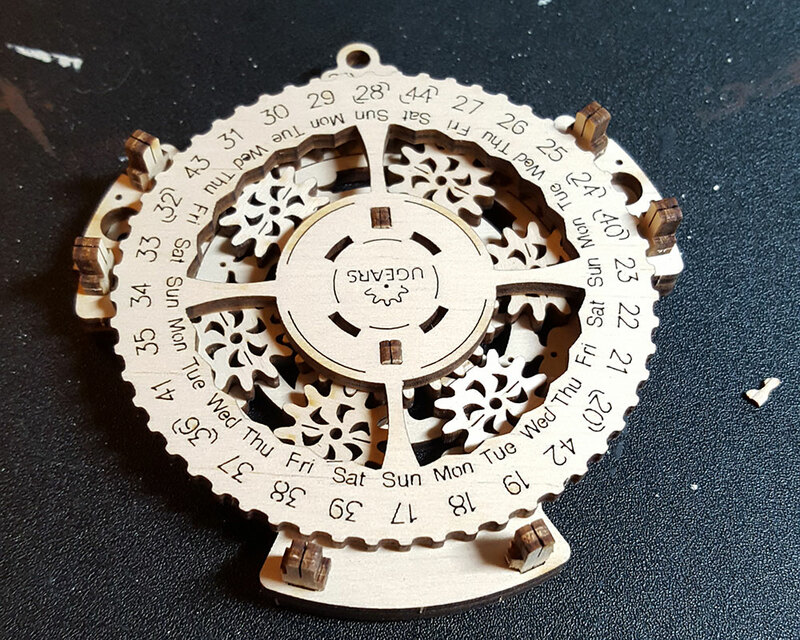 So there's the finished Date Navigator. 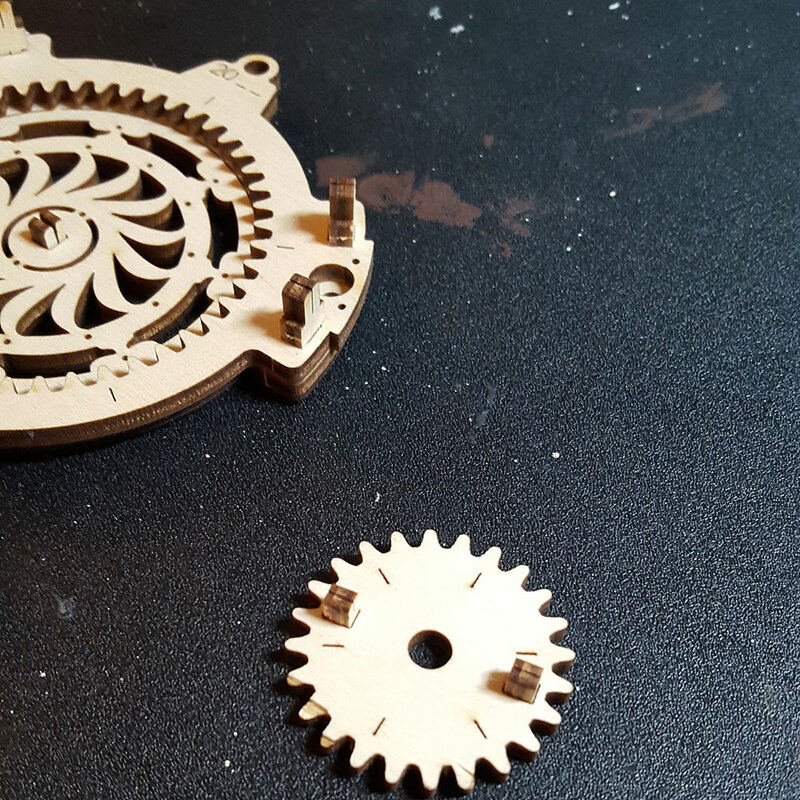 I did break one tiny wooden piece along the way because I'd put something on wrong and had to remove it. During the process of removing, the wood snapped. Thankfully, I was able to Kragle it back together and it seems to be holding. That brings up another note, though; tolerances on this thing are super tight. For some pieces (particularly the pegs) you might find that you need to remove some wood. Be careful and don't remove too much, though. I just used my Sword of Exact Zero! to scrape away just enough wood that the burn marks from the laser were gone and that proved to be a good amount. Now let's move on to what I imagine in my head are the Frequently Asked Questions. You align the year with the month at the top and look at the bottom to see the monthly calendar for that month/year combo. As you can see, it's good up until 2044, so from that angle, you definitely get your money's worth? This was one of my big questions going into it and I have to say... No. 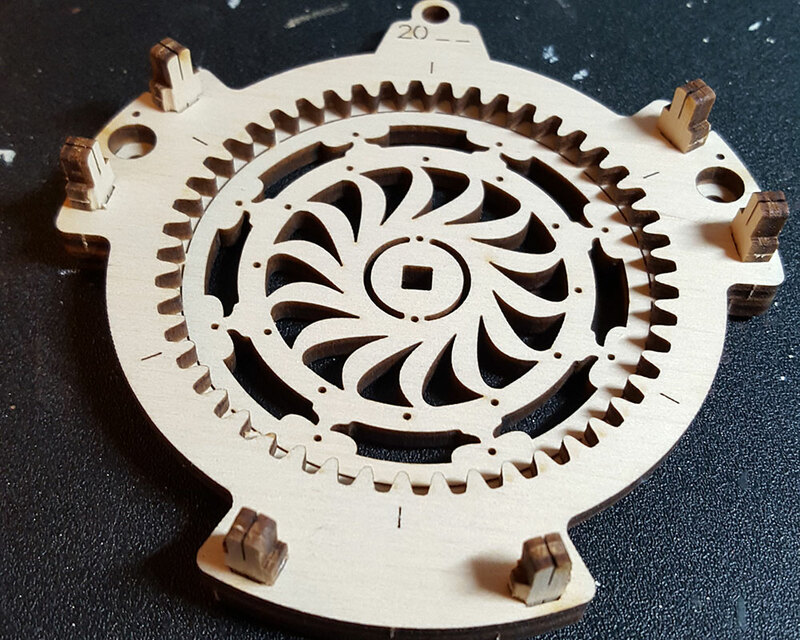 The tolerances are too tight and everything needs to be too precise. Besides, you'd be covering the markings etched into the wood. You could, however, stain it if you wanted to.... presumably. So will you buy more? Yes. Yes, I will. This was simple, but fun to build. I like the look and feel of it. I like that you can't just poke out the parts and insert tab A into slot B... I mean, you basically do, but it takes some care and patience, which is nice... but not too much, which is also nice. I'm really interested in building one of the music boces.